Every angle and every shape created by the sleek foil lines on these luxury acute angles information cards begin to feel like the many facets of a precious gemstone, drawing attention to your event details in letterpress print at its center. 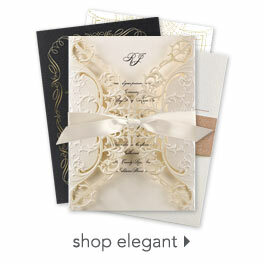 Personalization Options: Design is printed in your choice of three foil colors. Wording is printed in your choice of colors and fonts.